Do you think you've got what it takes to be a Masterchef? Level-up your cooking expertise and it's about time to show those potentials as you whip up those secret heirloom recipes and take your cooking on to the next level. 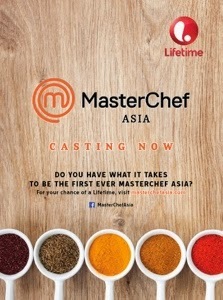 A+E Networks® Asia has greenlighted a pan-regional Asian version of the global hit reality cooking format, MasterChef. MasterChef Asia will debut on Lifetime later this year. LIFETIME™ is available on Cable Link Ch 223, Destiny Cable Ch 44 (Analogue) Ch 65 (Digital), Dream Satellite TV Ch 28, SKYCable SD Ch 65 and HD Ch 199, and other select provincial channels.